IN STOCK. Ships next business day! 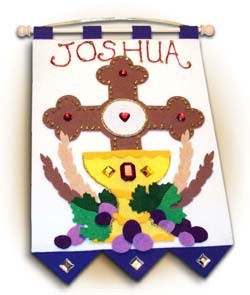 As always, these First Communion Banner kits are hand-crafted right here in the USA by us, the family behind Illuminated Ink, and are made from the highest quality components available. We also now have Self Adhesive Felt Letters available for use on this kit. They may be purchased here! "This product is a wonderful keepsake for First Communion! I bought my 1st kit 4 years ago and the banner still looks brand knew. I loved it so much I bought the same one to commemorate the day for our other daughter! The kit includes everything you need and is very easy to assemble. It truly is a great remembrance for such a special day! What I am most impressed with is Illuminated Inks professionalism and customer service!! They truly uphold a level of service that is not only outstanding, but very accommodating. Thank you Illuminated Ink for not only offering an exceptional product, but for truly blessing us with your supreme customer service!!!"